We arranged for Ben Fung, DPT, to review a pre-release version of the In Hand Health solution in early September (2016). You probably know who Ben is. 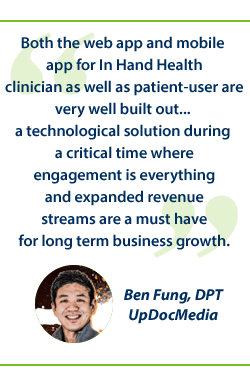 In case an introduction is needed, he is a consultant, writer, and speaker for the physical therapy industry and co-founder of UpDocMedia and definitely worth a follow on his Twitter, Facebook, and SnapChat (drbenfung) accounts. Ben was one of the first people outside the In Hand Health office to test the latest version of our telehealth tools which included the initial version of Therapist Essentials. Since then, we have addressed a few issues (aka small pesky bugs) and also added private video exercise creation to Therapist Essentials. His reactions to the In Hand Health solution are captured below or you can also read the review on UpDocMedia. In Hand Health is a unique platform combining patient engagement and provider communications as a healthcare portal, able to be leveraged strongly for continued care and telehealth on a highly customizable basis from patient to patient. Their approach is unique. Instead of creating a therapy solution by therapists, they are approaching an engagement problem in healthcare from a technology company’s perspective. As with many therapy based engagement platforms, communications, therapeutic exercise, and the usual compliance metrics are present. That, isn’t what is special. What is unique about In Hand Health is that the patient user must physically run the app to demonstrate adherence to an exercise prescription. The prescription can be given via stock videos and images. However, the truly unique element is via In Hand Health’s Therapist Essentials app. Through this app, a clinician can record an instructional video as well as a sets/reps video of their actual patient, in person and during treatment. This way, when patients are reminded by the app to perform their home programs, there is no confusion as to who should be doing it, how it should be done, how many reps/sets… as all these things are automated and dictated by the app from clinician to patient user. As a technology solution for physical therapy & healthcare, there were a LOT of backend data and metrics based programming put into play. The available statistics on patient engagement, compliance, and communications are truly impressive – I’m not even going to touch that. If you want the story, go ask the team at In Hand Health. Noted, these apps are rapidly undergoing continuous improvement; while the benefit of refinement exists, some stability concerns have presented themselves. Nevertheless, it isn’t anything a quick restart doesn’t fix. Both the web app and mobile app for In Hand Health clinician as well as patient-user are very well built out. With the ability to communicate via text, image, video; the customizable factor of actual patient exercise capture; metrics for days; and a highly integrated mobile-to-web-application platform, In Hand Health & Therapist Essentials presents itself as a therapy specific telehealth portal; a technological solution during a critical time where engagement is everything and expanded revenue streams are a must have for long term business growth.